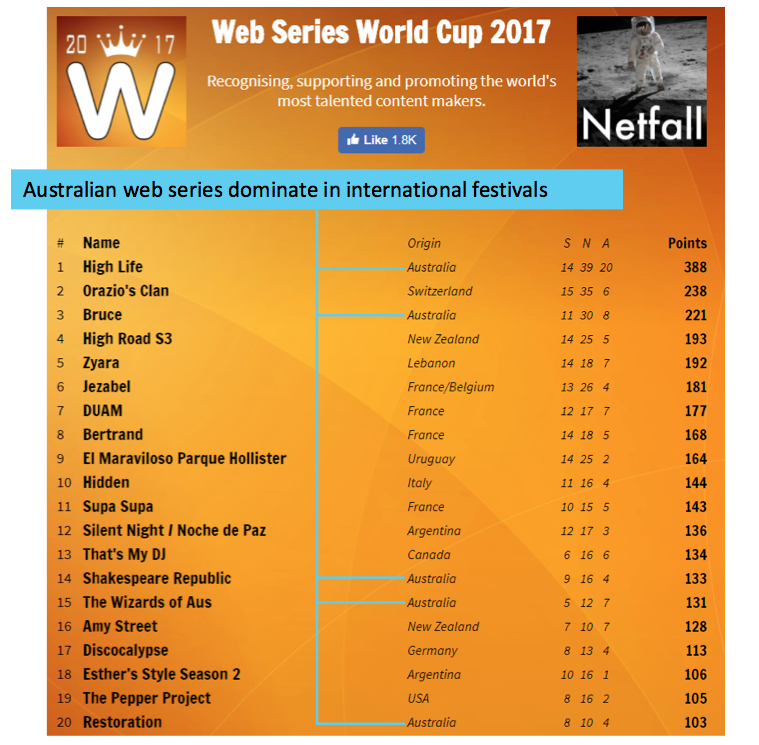 Australia web series at a glance. Key facts from a new medium. A comic drama about an unexpected teenage crisis. A gritty black comedy, set in an ordinary Aussie share-house that just happens to be a prison tent in Sydney Cove, 1788. Is Shakespeare still relevant? Does he still speak to us? Is he REALLY for everyone? Fed up with the Magical Realm’s obsession with large-scale fantasy warfare, Jack the Wizard migrates to Melbourne’s Western suburbs. Scifi: After a routine backup, Oliver Klein wakes to find his memories restored into a body that is not his own. The Horizon is based on the fictionalised ‘lives and loves of Sydney’s gay/queer & alternative community’. An early success story, the web series began in 2009 and is still going strong. It’s Australia’s most watched web series with 62 million views. Fighting Isis: Four stubble-wielding Aussie blokes make their way to the middle east to take down the world’s most notorious terrorist organisation. Girt By Fear: The strange and supernatural terrors lurking in the suburbs of Sydney. Goober: An optimistic Uber driver with autism causes confusion, chaos and comedy. The Katering Show: The journey of a food intolerant and an intolerable foodie. Black As: Off-beat, off track and on-line. Adventures in remote Arnhem Land. Mashed Up: They say being an intern can be hard but being a Melbourne WebFest intern might just be deadly. Preferred Media is a proud sponsor of Melbourne WebFest, continuing its ongoing commitment to service and support established and emerging media.